As forecasted, the day started grey windy and wet. There was a knock at the side hatch from the boaters moored in front of us along with an invitation to join them for morning tea. The invitation was readily accepted and we decamped de-boated to join Sue and Vic on No Problem. Sue and Jan were in a deep and meaningful conversation whilst Vic prepared some veg to make soup for lunch. Or they might have been chatting about the two legged field mouse nibbling the ginger cake Jan had baked yesterday! As you can see in the above photo, the sun eventually decided to put in an appearance. Jan then got into some exciting stuff and decided to clean the shower before peeling and cooking the bags of apples we picked from the tree beside Stockton Top Lock. I stayed out of the way in case this enthusiasm was contagious. Around 2,00pm the distant sound of a boat horn was heard and Jan looked out the porthole to see Seyella slowly glide past with Geoff at the helm. Seyella then moored behind Waiouru. Around mid afternoon Sue invited me to join her and Geoff for a dog walk around the local area. 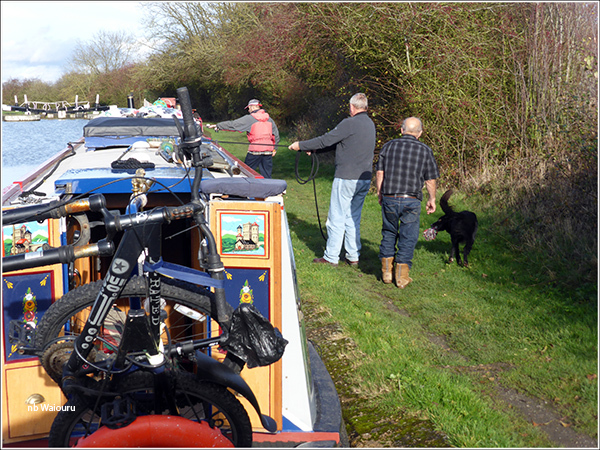 We walked down to Napton Junction and then along the towpath towards Braunston before cutting back across the fields. It was slightly muddy underfoot when off the towpath but the dogs appeared to revile in the conditions. 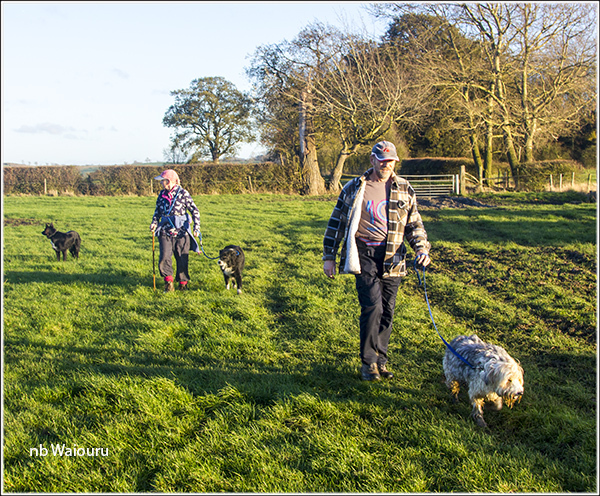 It has been a long time since I’ve walked with dogs through fields containing cattle and I had forgotten how curious the beasts are when they see dogs. Usually the cattle pay no attention to my passing. Sue keeps an eye on the cattle which were charging across the field to have a closer look. Back at the boats and we received an invitation from Geoff to join him and Mags for a hot drink. We’ve previously waved to Mags when passing so this was the first time we’d actually had a meeting and conversation. Afterwards Jan said “Mags sounds just like my grandmother (both from Yorkshire). If you would like to email us our address is jonestejm(at)gmail.com where the (at) is @. We can't promise a quick reply as we may be busy boating. Administration day and another boater meeting. 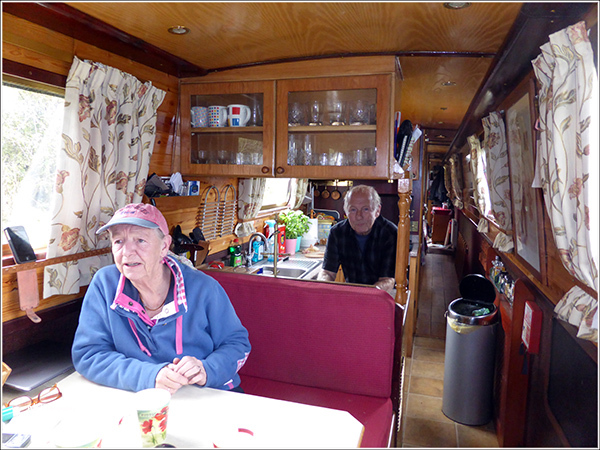 This blog is about us, Tom and Jan. After a decade of travelling from 'down-under' every two years to spend a brief few weeks having a wonderful canal holiday we decided to eliminate the travel and do it full time on retirement. In 2011 we moved to the UK and built Waiouru before spending 6 wonderful years cruising. In 2017 we sold our lovely boat and moved back to Perth, West Australia where other adventures are on the 'bucket list'. nb Waiouru. Powered by Blogger.